Benjamin Franklin was a political theorist, statesman, inventor and one of the Founding Fathers of the United States. 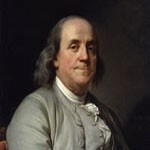 As a member of the group of men who signed the United States Declaration of Independence, Benjamin Franklin played a key role in instigating the American Revolutionary War and establishing the United States of America and its Constitution. Franklin was also known as the publisher of Poor Richard’s Almanack and for his many experiments with electricity, several of which brought about the invention of the lightning rod.